I’ve just listed this on Folksy – it’s the only one of its kind and I would really love someone (other than me) to wear it on Christmas Day on their festive outfit! Have you visited my folksy shop yet? If not, why not?! It’s easy to get to from the link on the right hand side which Andy kindly put in when he set up this blog. Folksy is a lovely site selling handmade British crafts. There are so many talented people out there – have a look round and you will find some fantastic items that will make wonderful original Christmas gifts for your family and friends (or you might find a little treat for yourself). My folksy experience started back in July and by November, when my first six listed items were due for renewal, I’d sold nothing. Naturally I was disappointed but decided to relist them. Then, to my delight, I got my first sale! Within a few hours the brooch was sold and the following day I got another sale! Big thank yous to folksy for promoting my work in this way. With only 3 items left in my shop I’ve selected a few more to list and they are now available to purchase … there are some little Christmas stockings and my mini stocking bunting which measures about 1 metre and has 9 little stockings attached, all with different decoration. 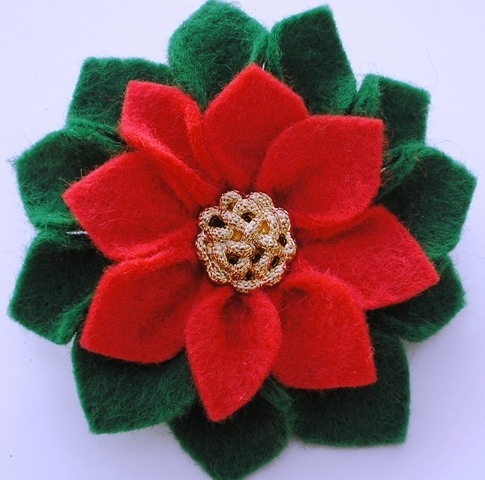 I’ve also listed some new brooches – perfect Christmas presents!! Here are some of the photos … hope you visit my shop soon!